My sister made this for the Super Bowl and it was delicious! There is no reason to ever buy an ice cream cake again. 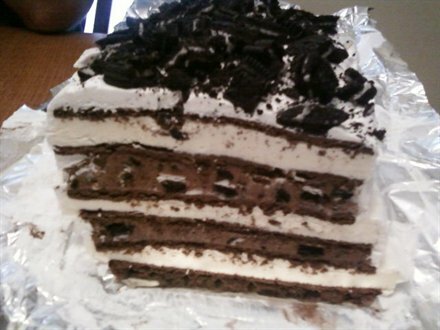 ARRANGE 4 ice cream sandwiches, side-by-side, on 24-in-long piece of foil, top with half the Cool Whip mixture. Repeat layers. Top with remaining sandwiches. Frost top and sides with remaining Cool Whip. Bring up foil sides, double fold top and ends to loosely seal packet.